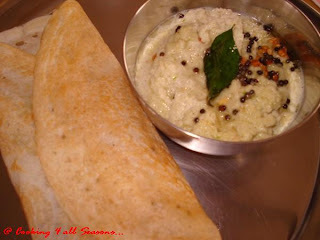 Cooking 4 all Seasons: Masala Dosa ~ 101 Dosa Varieties! As a kid I always ordered Masala Dosa when we eat out. Of course, this might sound strange, but I never used to eat the masala because I never preferred eating potatoes. Not sure why, but better part of my teenage was spent this way. It took me quite a long to realize that I could well order plain dosa. The mysterious ways the mind of a teenage works is hard to understand. I have spoken a great deal of my passion for this so common a dish down south. But one gets to appreciate it more when encountered by a North Indian or when you happen to be in a place where this is not easily available. I started eating the proper Masala Dosa with the Masala, maybe after going to college. And more so, when I started cooking myself. Amma makes this regularly at home. She makes the traditional Potato masala along with Coconut Chutney combinations. These three combinations is a die for one!. Now that my parents find themselves in a different place, where dosas are hard to find and neighbours equally in awe for these, its only common that Amma gets asked to prepare this frequently. Dad likes to invite people home, be it for any meal. Amma's fame traveled far beyond her and she was asked to prepare many such things without proper accessories. She was quite upset that Dad didn't agree to take the grinder along. But she found herself preparing Idlies and Dosas so many times, she was sad that Dad didn't heed her words. Her next item to be sent is a wet grinder! Dad, I believe ended up inviting people for breakfast mainly because they all wanted to eat idlies and dosas. But of course, the passion for these dishes is not just with North Indians. I find even south Indians, though they eat these so frequently, never refuse to have a well cooked one! On New year eve every year, we have many guests dropping in and Amma usually prepares breakfast for all. The usual menu will be Idly, Dosa, Vada along with Sambar and coconut chutney for Vegetarians and Chicken Pulusu for rest. This is the first year we didn't have this gala at home. As every family, mine too is full of contradictions. One eats one, while another does not eat the same. So its always been a challenge to dish up something to please everybody! I have never seen Amma ever complaining that each of us want separate things for the same meal. She used to cook everything and that too in record time!. 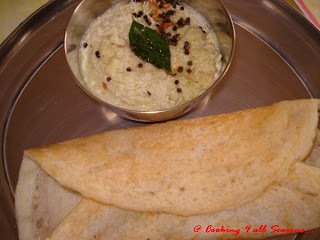 Dad and Hubby does not like coconut chutney whereas my brother likes only that! Now I find that my daughter too, doesn't like coconut chutney. I find that groundnut chutney dominates and makes its presence felt, while coconut chutney adds zing to the dish without making much ado about its presence. Though I am fond of groundnut chutney a lot, there are few items for which I strictly prefer only coconut chutney and Masala Dosa happens to be one such dish. My brother in laws love the coconut chutney that Amma prepares. So when they used to visit us, I especially ask Amma prepare that and send across! But now at home, since its just going to be me who eats this chutney, I never bother to prepare when I am making the Potato Masala for dosa. This time at ma's place, I found it very convenient to prepare this combination. Cashew Nuts - 5 whole broken to 4 pieces. Chop onions into juliennes. Heat a kadai with oil. Once its hot, add all the seasoning ingredients except coriander. Sauté well. Once its splutters, add onions. Add salt and simmer and let it fry for 2 mins. When you find the onions turning translucent, smash the potatoes with palm and crumble it to the oil. This way you will have few big chunks and few mashed potatoes. Keep sautéing and cook on high flame for 2 mins.Ensure it doesn't get burnt. Then simmer and add water. Adjust salt and let it cook for 5 mins. Finally garnish with chopped coriander.. Note: Extra onions add more taste to this masala. And also should not add too much of water since this is going to on top of a Dosa! Heat a tawa and once its really hot, take a ladleful of batter and spread on the pan. Sprinkle oil and little ghee. Once its cooked on one side, turn to the other side and cook. It should be over cooked. Take a spoon full of potato masala, and place in the center. Fold the dosa from both sides as in the picture. Enjoy your new year with a spicy masala dosa!